Amber Delao was living last fall with her two children in a one-bedroom trailer on her aunt's Mead Valley property. They had no electricity, and the nights got very cold in the rural southwest Riverside County community. But today, Delao's family lives in a three-bedroom apartment in the Casitas del Valle, a new housing complex built in Moreno Valley last year for low-income families. The 40-unit complex is professionally managed and provides its residents a computer center, a small playground and after-school program for children. 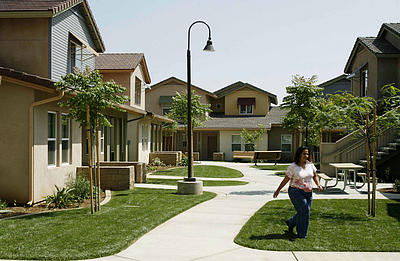 Resident Kiona Morones strolls in the courtyard at Casitas del Valle in Moreno Valley, a housing complex for low-income families. "You can't ask for anything better," Delao said. The Casitas del Valle project is just one example of how Inland communities are trying to meet state mandates to provide affordable housing to needy families, even as housing prices have increased dramatically in the past decade. State law requires each region in California to develop plans to provide enough housing to accommodate growth. A regional agency allocates numbers of new residential units to each city and county every seven years, including housing for low-income families. The state defines "low income" as $47,350 or less for a family of four annually in Riverside and San Bernardino counties. Median home prices, however, were $409,000 in Riverside County and $370,000 in San Bernardino County as of April, according to Dataquick Information Systems. "Housing prices are going up, but families' incomes are not keeping pace," said Global Premier Development Vice President Steven Hernandez, whose Irvine company is building affordable housing projects in Moreno Valley and Mecca. "We find there's a dire need." Cities and counties form partnerships with developers to build affordable housing. The builders usually need public subsidies or tax credits to keep rents at levels needy families can afford, Moreno Valley city Redevelopment Manager Mitch Slagerman said by phone. "The (rental) revenues you generate can't cover the cost of building and maintaining it," he said. Rents are kept at affordable levels for 55 years in exchange for the tax credits and subsidies, Slagerman said. The Coachella Valley Housing Coalition built Casitas del Valle for $9.1 million with a combination of tax credits and local redevelopment funds, the nonprofit's Community Services Director Nadia Villagran said. The project took 10 years to complete because of the difficulty obtaining financing, she said. "You have to pile up a large number of funding sources: state, federal, county and city," Villagran said by phone. Monthly rents at Casitas del Valle range from $322 for a one-bedroom apartment to $817 for a four-bedroom apartment, Villagran said. 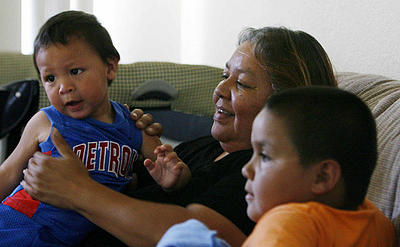 Casitas del Valle resident Yolanda Dominguez plays with her grandchildren, Frankie Aguilar Jr., left, and Armando Aguirre. Some communities have difficulty meeting the goals set out by the Southern California Association of Governments, the planning agency for Riverside, San Bernardino, Los Angeles, Orange, Ventura and Imperial counties. For example, SCAG allocated the city of Colton a total of 3,673 housing units, including 1,437 for low and very-low income families. "We appealed that for a couple of reasons, most significant (of which) is a large portion of our parcels are restricted by the (endangered) Delhi Sand flower-loving fly in the west part of the city, which is set to be a commercial area if development is allowed there in the future," city Community Development Director David Zamora said. Other communities don't want low-income housing. Wildomar residents told Riverside County officials they feared the kind of tenants a proposed 60-unit housing complex would bring. SCAG officials are reviewing appeals and will redistribute housing units if a city or county is successful on appeal, spokesman Jeff Lustgarten said. "It's a zero-sum game in essence," he said by phone. "That's one of the reasons why (the process) is so tricky." Appeals have sometimes wound up in litigation, Lustgarten added. Still other communities have difficulty finding developers who will build affordable housing, even after offering incentives. "If the developers don't come, and they don't want to do those projects, there is nothing we can do," Calimesa Community Development Director Gabriel Elliot said. Ultimately, affordable housing developers and city officials want to see families move up the economic ladder. The Coachella Valley Housing Coalition has a program to help families move up to homeownership, and educate them on issues such as mortgages, predatory lending and property taxes, Villagran said. Delao currently works as a child-care provider, watching over her children and her sister's seven children who also live in Casitas del Valle. But she hopes to own a home one day for the children, hopefully with a big backyard. "I need a backyard for the kids," Delao said. "I need ... an area where I can watch them." Staff writers Massiel De Guevara, Naomi Kresge, Sandra Baltazar Martínez and Gail Wesson contributed to this report.